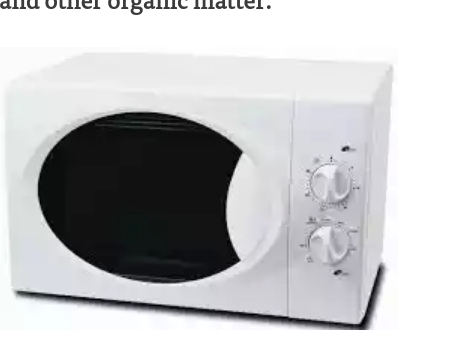 An experiment conducted at home for a high school science fair five years ago has verified the dangers of microwave ovens not only to humans, but even to plants and other organic matter. 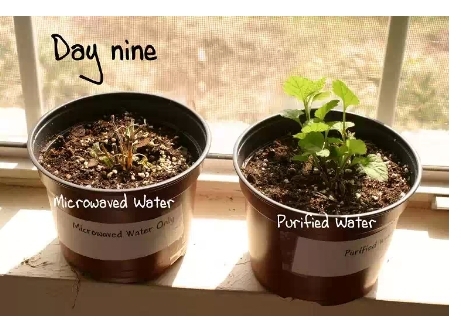 The experiment showed that microwaved water given to a plant causes the plant to wither and die within days; however, another identical plant given water that was boiled on a conventional stove grew normally during the same time period. Many studies conducted throughout the world have repeatedly highlighted the deleterious effects of microwave ovens on human health. In fact microwave ovens are so dangerous that they were banned in Russia from 1976 to 1987. Twenty years of thorough research by Russian scientists convinced them that the dangers of the devices outweighed the benefits in cooking time. This experiment further verifies their findings. In the home experiment, filtered water was divided into two parts. One part would be microwaved and allowed to cool before being given to the plant, while the second part would be heated on a conventional stove top and given to an identical plant. Results were observed over a nine day period. By the third day it was already clear that the plant given the microwaved water was not faring as well as its counterpart. By the ninth day the microwaved plant was virtually nonexistent in its pot, having literally shrunk in size to just a few inches above the soil. The second plant was growing beautifully as seen in the picture below. Studies have shown that human breast milk heated in microwave ovens is altered and that not only is its vitamin content depleted, but some of the amino acids are also rendered biologically inactive. Some of the altered amino acids are poisons to both the nervous system and the kidneys. Microwave ovens do not heat food evenly. This means that some parts are overcooked, which can change their molecular structure into dangerous carcinogenic substances, while other parts are undercooked increasing the risk of food poisoning. Not only is the food cooked in microwave ovens dangerous, but also are the devices themselves. Every part from the power chord right up to the magnetron itself, which is the part that actually emits the radiation heating the food, is dangerous due to high levels of EM emissions. Tests performed by manufacturers at a distance of two inches show that microwaves do leak out of the devices no matter how expensive or well made the model is. However since microwave radiation drops off dramatically with distance, at 20 inches the radiation is approximately 100 times less than at 2 inches, so it’s a good idea to stand back from the unit if you must use one. Microwaves can pass through walls, so if it’s placed against an adjacent wall, those on the other side will be exposed to higher levels of radiation. As this experiment clearly shows, microwaving your food, even if you are just reheating your tea, is definitely not a good idea. The microwaved plant would agree if it could talk. If the microwaved plant agrees, how much more you human? Good discovery,but how fair will this discovery be linked to human beings,since plants and animals have differences in their cells tissues?